The Rambler X2 works with the YETI 50 through the 125 and won’t disappoint. YETI Coolers are tough, but the Rambler is tougher, and when the rubber hits the road, its gotta be. 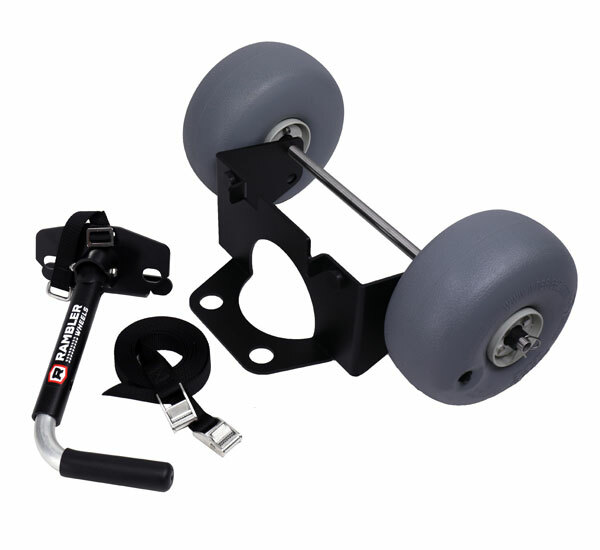 These 8” Marathon wheels are flat free, maintenance free, and worry free. 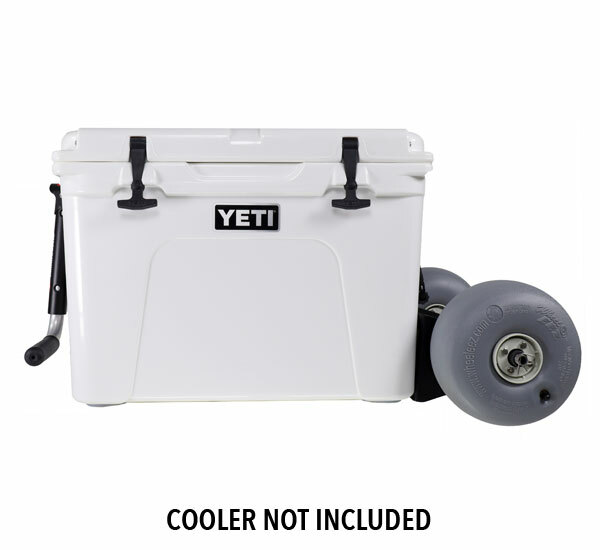 After years of research and development, we are proud to offer a wheel system worthy of a YETI Cooler and those that own them. 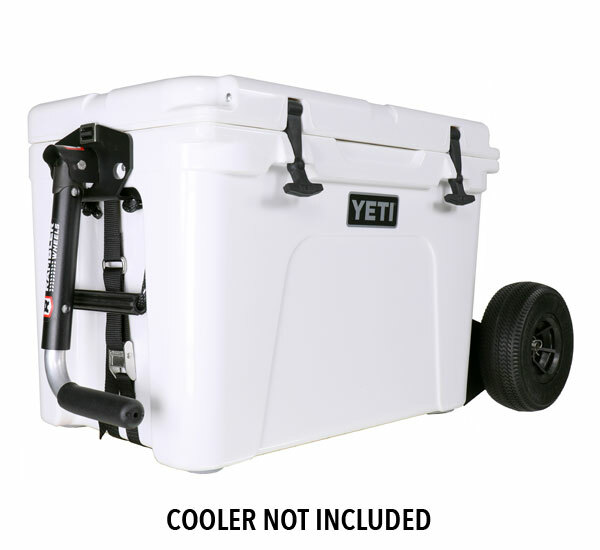 With our Patent Pending design, the Rambler X2 is all about ease of use that is compact and packable with quick set up and take down using the integrated tie-down slots on YETI Tundra Coolers. NO tools, NO nuts & bolts, NO HASSLE. 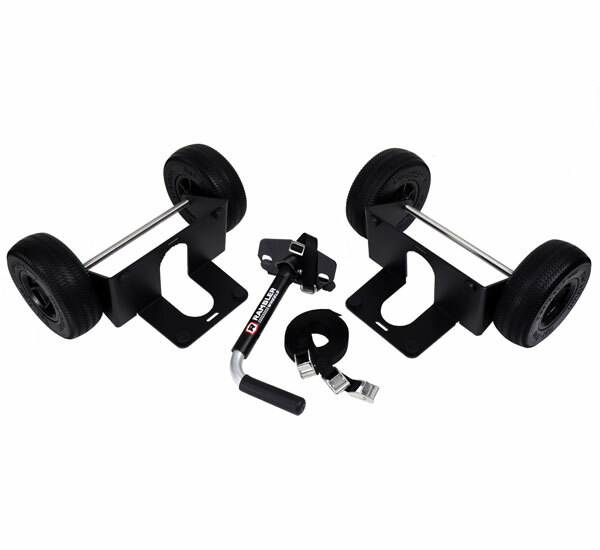 The rugged 3/16” aluminum plating is shaped into form fitting brackets that snuggly fit to a YETI like a thumb in a bass’ mouth. Its just meant to be there. Some proud owners of the Rambler see no reason to ever take it off. And why would they? The Rambler does not take away any functions of a YETI, including the drain plug. And now with the Double Duty Lock Hook you can secure your YETI and Rambler to your truck, boat, or whatever with a cable lock (not included). 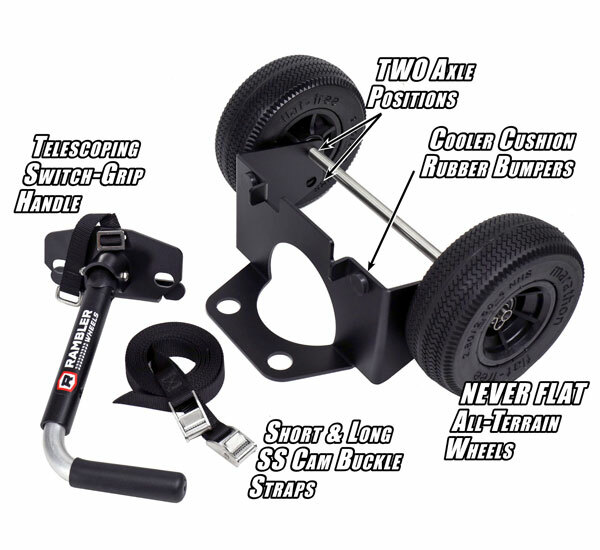 While the Rambler starts with great wheels, it finishes with a one of a kind Telescoping Switchgrip Handle that is specifically designed to attach to YETI’s molded-in handles. 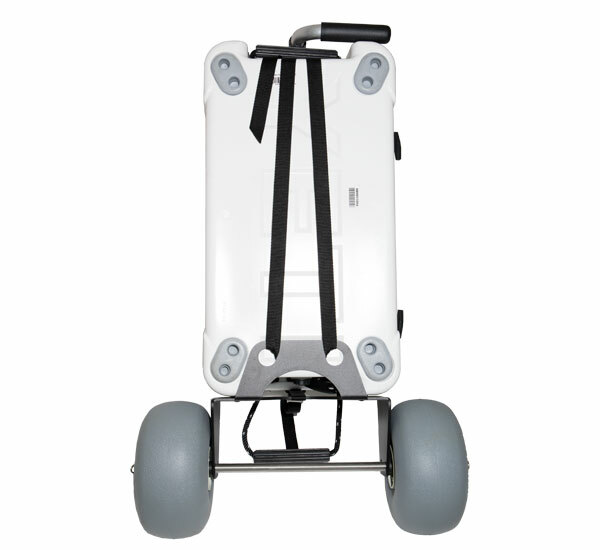 The handle’s two position telescoping lengths allow the user to stand upright and to maintain a comfortable distance from the cooler while walking and can switch to be right or left handed. 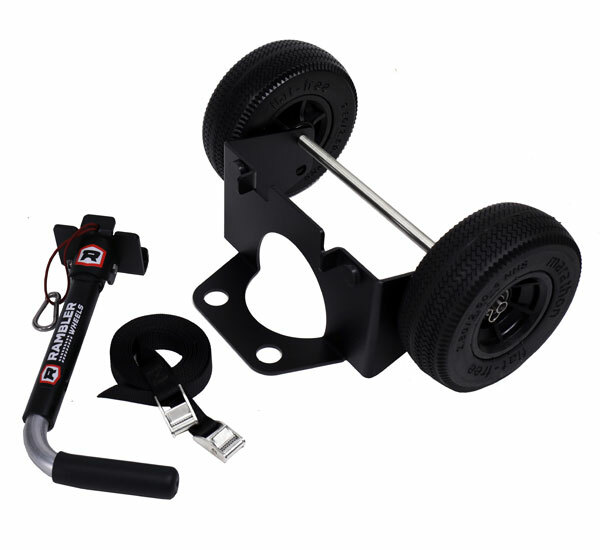 Without this, the cooler will ride up onto the heels of the user especially down hills. 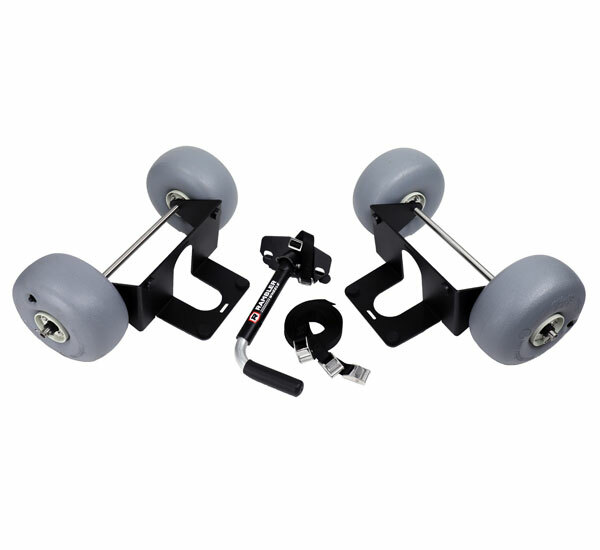 This handle gets the job done and then swings down, and out of the way. The Rambler takes your YETI anywhere with more ease than ever. (SPOILER ALERT!) These wheels will spoil you. You will never look at your Yeti cooler the same way again. Instead of being too heavy when loaded up to want to take anywhere, it will be so easy to transport your heavy Yeti anywhere! We put our newly arrived Rambler wheels to work at our weeklong family vacation on The beaches of South Padre Island. 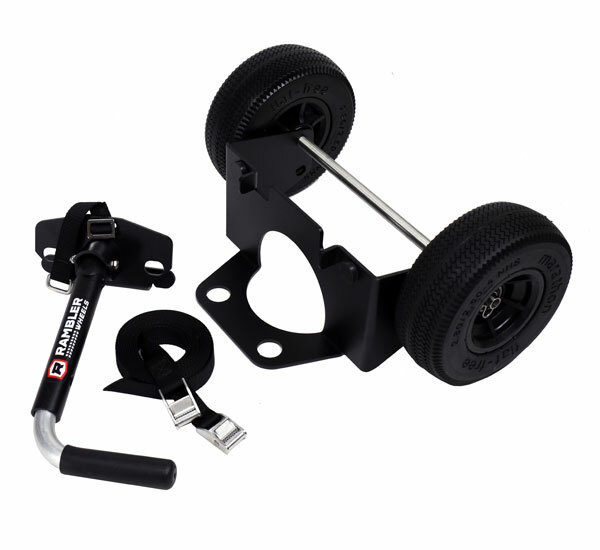 The construction and design of the wheel assembly is solid and durable. Easy to install. They were a little pricey but, let’s face it, I did buy a Yeti after all! Easy to install and Perfect Fit. Can’t imagine having our Yeti cooler without these wheels. Makes it so convenient to get a full cooler onto the boat. Would definitely recommend! I’ve had the X2 with all-terrain wheels for several months now and have taken it on 4 overnight camping trips and some days trips. 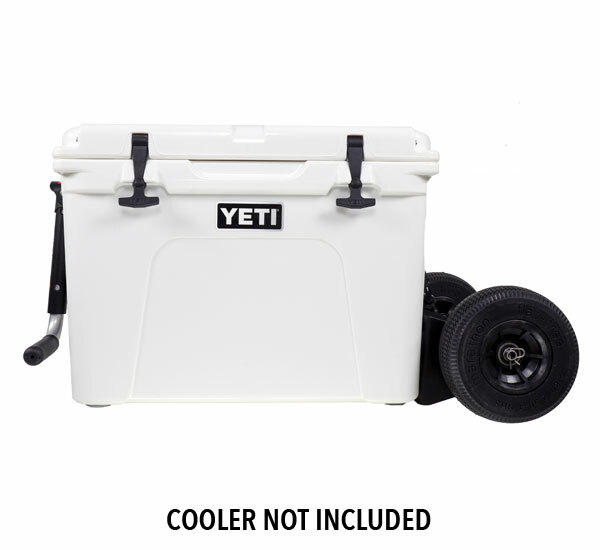 Pros – Makes one person handling of my 65 qt Yeti possible when fully loaded and its easy to roll around and doesn’t bang into me. It was pretty straight forward to install but I think the installations instructions could use a better layout to make it easier to read. Con – the handle in its shortest mode does not fold up against my 65 qt Yeti – its too long. This is a real problem when loading into a vehicle. The handle binds up against the cooler ( extending below the bottom of the cooler) and makes it difficult to push the cooler into the vehicle ( I always go handle first so when I pull the cooler out it lands on its wheels – I’m usually by myself so this method works best). I have to go back and forth from the side door to the rear door of the vehicle to move the handle up so it won’t bind for me to move the cooler into the vehicle – a real hassle. I’m also concerned that I could bend the handle if I don’t do the back-and-forth thing. The X2 would have gotten a 5 star rating if it wasn’t for this issue. I recommend it. Great addition to my yeti. 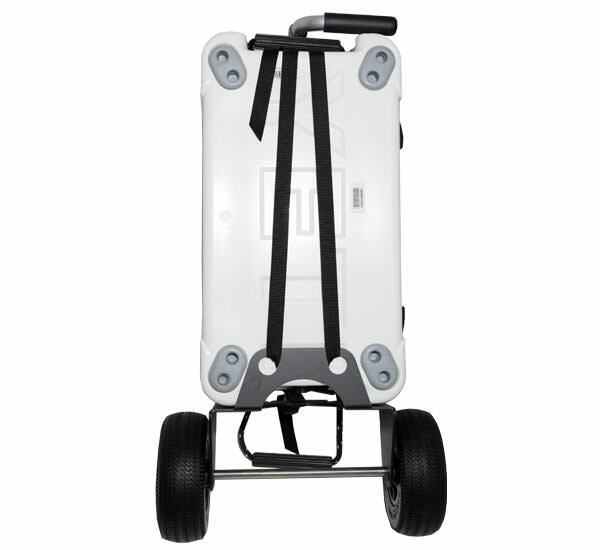 Handles a loaded cooler over rough terrain with ease. Now no excuse not to take it to the park. Will buy again. I searched the internet for weeks to find a solution for making my Yeti 50 easier to move around (especially when full loaded). 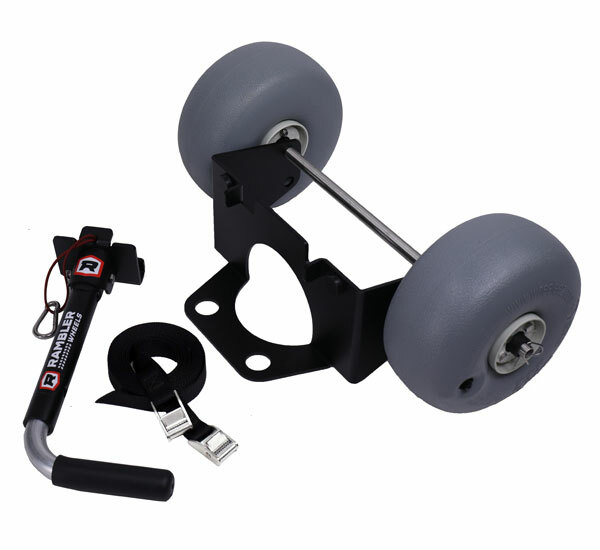 These Rambler wheels came highly recommended from many sources. These were easy to install and are rugged enough to last. Can’t wait to show them off at my next tailgate!